With a day job as an advertising copywriter and a wife who runs a graphic design studio in Austin, CSA Images being available on iStockphoto is big news. Considered one of the world's leading modern design resources for the creation and preservation of print and pop culture. CSA Images capture the authenticity and detail of hand-drawn illustration, and digitally preserve the legacy and artifacts of ink printed on paper. 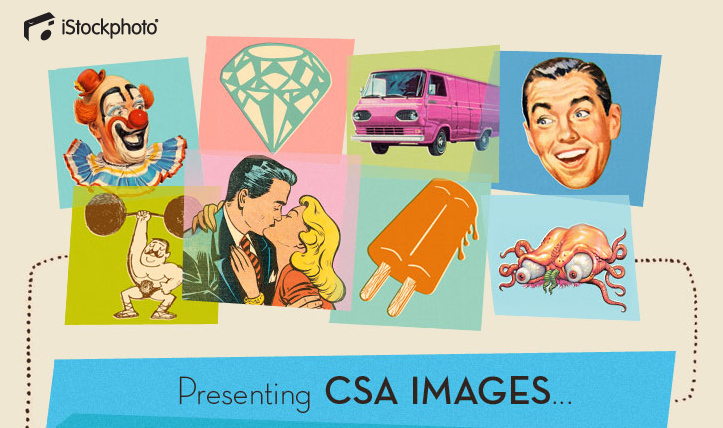 CSA Images contain tens of thousands of illustrations and design elements, including icons, ornaments, patterns, borders and illustrated words. And iStockphoto is one of the least expensive, royalty-free stock image sites. So why should the mid-century design world care? Two reasons: 1) Hopefully vintage and modern design store advertising will get a lot more interesting and 2) While not being the cheapest pieces of mid-century-style art, CSA Images are pieces of art. And with over 5,000 CSA Images available for use, you might be able to find something for that blank spot in your hallway. FYI: iStock licenses allow for "Prints, posters, stationery items and other reproductions for personal or business use (but NOT for resale or license)."